Feiwel & Friends, 9781250039262, 256pp. "Evan Quick, Hero's Log, May the 25th… and darn it – I just can't do this. I'm never going to be a Mask. Get over it Evan." Evan Quick has spent his whole life dreaming of becoming a hero. Every morning he wakes up and runs through a checklist of test to see if he's developed powers over night, and every day it is the same thing – nothing. No flying, no super strength, no heat rays or cold beams. No invulnerability – that always hurt to check – no telepathy, no magic. Not even the ability to light a light bulb without flipping a switch. And now, he's finally ready to give up. But then, the class field trip to the Mask Museum is interrupted by a super villain attack, and Evan somehow manages to survive a death ray. Even better, Evan's favorite Mask, Captain Commanding, shows up to save them all -- and when things go very wrong, it's Evan who finds the strength to come to Captain Commanding's rescue. Kelly McCullough is the author of the adult fantasy series Webmage and Assassin's Blade. 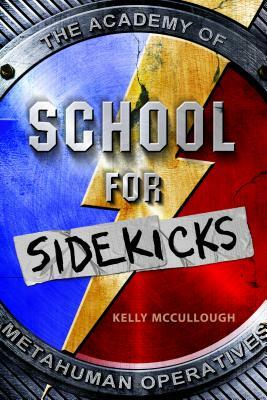 School for Sidekicks was his first novel for young readers. He lives in Wisconsin with his physics professor wife and a small herd of cats, all of whom he adores.